The Annual Dinner is the Chamber’s opportunity to celebrate our successes of the year and look ahead. New officers and Board Members are announced and awards such as Volunteer of the Year, Diplomat of the Year, and the Heise Entrepreneurial Spirit Award are presented. 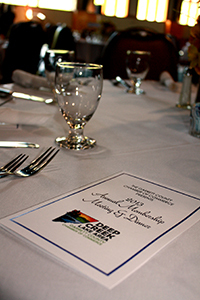 The 2019 Annual Membership Meeting & Dinner will be held on Thursday, June 6th in the McHenry Lodge at Wisp Resort. The evening will include hosted beer and wine beginning at 6pm, dinner at 6:30pm and the program at 8pm. This Annual Dinner presents a great opportunity to network with Chamber members, county business leaders, and government officials while enjoying a wonderful dinner and entertainment.